Myaz has been in a long protracted struggle to musically survive, but his belief in his dream has allowed him to persevere. During his five-year hiatus, Myaz did not allow the grass to accumulate under his feet. His musical creativity was not stifled. He did not release singles like other singers have done, and did not get caught up in the one rhythm-driven compilation phenomenon dominating the reggae market, yet still he remained quite busy musically. During this time, Myaz demonstrated his broad breath, versatility and command of music by composing, producing, writing, arranging, collaborating and singing. 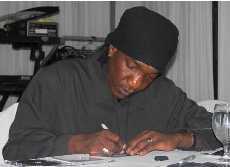 His efforts culminated in two CDS–his eagerly awaited and much anticipated LONG STORY SHORT, released under the aegis of JAMPRO in Jamaica in November 2005 (with future release dates planned for Florida and New York); the second, a work in progress, is an instrumental album titled, YOUVE GOT ME, a first of its kind in Jamaica, featuring the bass as the lead instrument. Fusion musicians like George Duke, Herbie Hancock, premier bassists Jaco Pastorius, Marcus Miller and Stanley Clarke inspired the concept for YOUVE GOT ME. Myaz explains, The bass was always an accompanying rather than lead instrument and the concept was to create melodies and not make them repetitious or monotonous. As a formally trained musician and proficient on many musical instruments, Myaz was able to utilize his knowledge of other instruments to transform the bass melodies and accomplish variations. While juggling his musical career between the responsibilities of single parenthood, Benjy continued to further bolster his reputation and expand his musical development by working with top entertainment figures. From Urban to Reggae to Pop to Gospel and Folk, many benefited from his musical creativity including gospel singer Joan Myers, a former lead with the internationally renowned Grace Thrillers, whose debut album, Wanna B Ur, he produced. He collaborated with Canadian-based dub poet, Michael St. George, singer/guitarist Junior Jazz and Freddie McGregor, Third World, Ken Boothe, Joanna Marie, and Pam Hall. He co-produced Banxs Chariots of Steele in 2004 with Third World lead guitarist Steven ‘Cat Coore; played bass on Sizzlas Da Real Thing. Myaz is the musical director for Moon Splash, Bankie Banxs musical festival held in Anguilla annually. 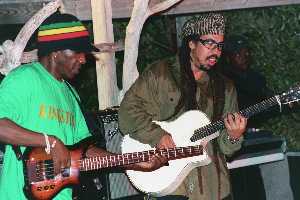 He has toured as a bassist with Jimmy Cliff, Culture, Toots and the Maytals, DJ Shinehead and J.C. Lodge, and appeared also as bassist with Sounds of Blackness. As a solo vocalist, he toured the U.S. in 2000 with Freddie McGregor and Glen Washington. 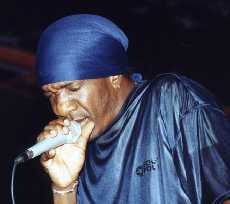 As if this wasnt enough, Myaz kept up his hectic schedule, as a solo act, performing alongside international artists Jeffrey Osbourne, James Ingram, Gladys Knight, Angie Stone, Kevon Edmonds and Randy Crawford at major festivals like World Food Day in 2000, Jamaica Jazz Festival, Jamaica Prime Ministers Ball and Reggae Sumfest. 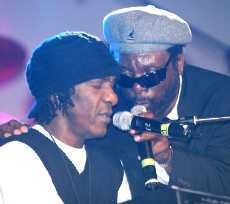 His work with Toots & the Maytals earned him a nomination medal and certificate from NARAS for Toots 2000 Grammy-nominated album. Whether Myaz is at work in the studio creating music, on stage performing or going about his daily business, his caring humility and warm humbleness draw people to him. His wit and sense of humor is equally matched by his profound faith in God and the deep ethical foundation bequeathed him by his parents. Born in the little town of Haddington, Hanover, Jamaica to the Reverend Egbert Myers (the pastor of Holiness Christian Church) and Mrs. Resa Myers, Benjy along with his seven siblings participated in their church choir at the urging of their parents. Myaz musical skills continued to develop at Herbert Morrison High School where he played in the school band with drummers like Paul Kastick of Shaggys band. Benjy has been a musician his entire life and is proficient on at least seven musical instruments although his first love is the bass. Myaz who began singing later in his careera step he describes as just a transition, not a move, found the transition from musician to singer difficult because of everyone pidgeonholed him as a bass player. Singing allowed him to become a performing and recording artist, but he considers it just the cream of the crop of his musical career. The difficulty jazz guitarist George Benson encountered in his transition to a singer is akin to Myaz own situation. His friend and mentor Junior Jazz, a singing guitarist, also had a similar experience. Bensons successful transition is also a model from which Myaz can take heart. To his credit, Benjy Myaz has prepared himself by being versed in the business aspect of the music industry and has control over all aspects of his career. He owns his publishing and production company, My Werks Music, and his original songs are copyrighted. His technical know-how ensures proper mastering of his own recordings, and he is capable of engineering both live performance and studio recordings. The creative mind has many detours: Bob Andy, one of Jamaicas greatest songwriters, said that had he not been a singer he would have been a painter because he saw colors in his head when writing songs. Myazs creativity is not limited to music; as a graphic designer and art director he designs the artwork and photography for his albums. The imaginative and eye catching graphics on LONG STORY SHORT was his work. Myaz has made many sacrifices and turned down many opportunities that would have allowed him to live comfortably in pursuit of his dreams and ambitions. The demands and instability of a musicians life coupled with challenges of single parenthood have often times proved daunting, especially when they clash; however, because of his solid foundation he has been able to hold it all together. Myaz wrote and produced Conversation, the single for Third World’s Live it Up album. He was never appropriately credited or compensated. And though he has resolved his difference with Third World, at the time the experience left a bitter taste in his mouth. As he noted then, I guess in the music business people like to collaborate, enhance their product, then disrespect. They said I had to pay my dues; unfortunately, I had to pay it this way. Both Third World and Myaz have moved on. Observing Benjy in the studio is witness to true brilliance at work. His humor and genius at times are one and the same. Yet his dedication to his talent and the integrity of his craft is singular, there is more to him than the music. The desire to be respected as great musician and his ambition to be successful is also evident. And, like true artists who usually know the kind of musical portraits they want to create, compromise, though necessary, comes hard. Benjy has a decided distaste for conforming to the latest commercial trends. This is because, as he notes: I didn’t grow up on top 40; I am very selective with my music. Jazz gives me the freedom of expression, there [are] no limitations to it. However, he is confronted with the dilemma all true artists in todays music industry face; dilemma geniuses like Stevie Wonder, Marvin Gaye and Bob Marley struggled to reconcilethat of how to become a commercially viable artist while remaining true to your creative vision. The balance is delicate and difficult, yet attainable. The market is very fickle and fad-driven, often requiring gimmicks and low brow imagery instead of creativity and quality as hallmarks of commercial success. Record labels are even more brutal because of their bottom line sales. They are notoriously unsentimental and have little loyalty for artists who dont do whatever it takes to rake in the dollars. Described by one music critic as a jewel of an album, LONG STORY SHORT could further signal the revival of lovers rock in Jamaica, a genre of reggae which is more popular in England than in Jamaica at present. LONG STORY SHORT is a pleasing album, especially for romantics and lovers. The album is dominated by polished lovers’ rock songs, including originals like You and Me, Make It Up To You, Irresistible Lady, Before You Go, and, of course, the title track, Long Story Short. Noteworthy are the two impressive covers of Bobby Caldwell, Do for Love (a reggae groove and Latin bounce). To watch Myaz perform this track live is exciting; he scats vocally while playing his fretless bass with the eloquence and proficient ease reminiscent of George Benson live on On Broadway. The majority of the 15 tracks are composed and produced by Benjy Myaz with co-production by Barry O’Hare, Freddie McGregor and Bobby Digital. Myaz shows his command and versatility playing several instruments on the album, including the bass, organ, clavinet, and acoustic guitar, piccolo and also singing background vocals. Tthough he is not quite a rudeboy lover like Beres Hammond or Freddie McGregor whose love songs tend to be rooted in the Jamaican psyche, Myaz pitches his love tent high on the love landscape. His charismatic voice with its melodious delivery makes his message resonate. LONG STORY SHORT brings a breath of freshness to Jamaican lovers rock and reggae music. Fans both old and new will be impressed with the breadth of the multi-faceted musical creativity of Benjy Myaz, the allure of his voice and the intelligence of his love stories. LONG STORY SHORT was a long time coming but it was well worth the wait.